Zeiss Monocular - a full, hands-on review of the DS 6X18B T*. A Zeiss Monocular - Is it Worth the Premium Price? A Carl Zeiss monocular has the standing of a high-quality optic without knowing anything more than the brand name. A part of this stems from the fact that they command a premium value. Is it simply because of the Zeiss name on it? Or does Zeiss really put its reputation into this tiny 6X18 monocular and make a superior optical instrument? You may have considered this question, too. If you've already looked at our page about monoculars, you know how much we appreciate a good monocular for all the advantages it can bring when it's just not reasonable to carry even a compact binocular. Having used other Zeiss optics and having been impressed with them, we were looking forward to getting one of the Zeiss monoculars and testing it to see just what people get for their money. Last month we bought the Zeiss 6X18B T* Design Selection monocular and the result is this - the first of our hands-on Carl Zeiss monocular reviews. When we took it out of the box and made initial comparisons with a couple of other monoculars that were nearby, we quickly noted the "wow factor" in 6X18B view of color and detail and organized the schedule to provide time to really study this instrument! At only 3.7in/94mm tall by 1.2in/30mm diameter, it's certainly the size we look for in pocket monoculars and small enough to fit into any but the smallest of women's purses (yes - many women carry a monocular in their purse!). At 2oz/58g, it's light enough to wear around your neck on the provided lanyard and completely forget you're carrying it. In an average-size hand, it's possible to have only the eyecup element protruding from the closed hand - which allowed us to use it surreptitiously at church and seminars when we were otherwise unable to see clearly what was being done at the front of the room. We noticed that one or two internet dealers wrote that the 6X18B T* Design Selection monocular was waterproof and one went so far as to say it was fog-proof. We found the model we tested was neither waterproof nor fog-proof. The provided owner's manual describes it as "splash-proof" and the Zeiss web site describes it as "water resistant - sealed against spray water." Both of these official descriptions are accurate enough - we don't see how the instrument can be submerged without allowing some water inside due to the focus adjustment design we describe below. This pocket monocular comes with a soft leather case which zips closed to completely protect it from scratches and abrasions while it's accompanying you on your excursions. A nice, creative touch by Zeiss was to put a small metal grommet in the back of the leather case for the instrument's nylon lanyard to fit through. 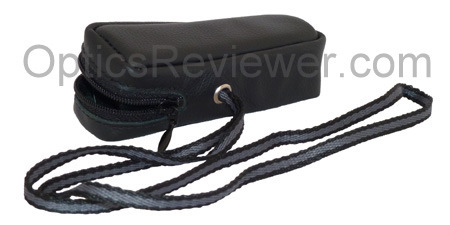 That way, you're able to simply unzip the case, slip the instrument free and use it without fear of losing the case. During interim moments when you're not actively using it, you can slip the monocular back into its case and, even without zipping it shut, the enclosed objective lens' end will allay any nervousness you might have about the losing anything while it's hanging from your neck. We understand that the 6X18B DS' metal body is resistant to corrosion. This will be appreciated by our bird watching friends who take it with them, as an extra optic for casual use, on birding expeditions to humid areas. The Zeiss design team put the 6X18B together with a phase-corrected roof prism and fully multi-coated lenses, including their patented T* anti-reflective coating for a particularly bright, clear, crisp, highly contrasted image. Combine this with a 3mm exit pupil and you have a satisfyingly bright image delivered to your eye. It's fair to say that this modestly-sized monocular provides an image to compete with a significantly larger objective lens' light-gathering ability and a more powerful magnification. We were able to identify images with greater ease and certainty with it than with some larger monoculars, which is a high priority with monocular users. When comparing this pocket monocular to others, we found it provided significantly greater color fidelity and resolution than has typically been available. We especially found the coloring of birds and insects to be vivid and the rendering of details to be very good. The field of view is 394ft at 1,000yds (120m at 1,000m) - which we calculate to provide a 6.9° angle of view. This is a wide enough field of view to satisfy even our craving to be able to take in as much of the action as is possible! Our tests showed that the resolution of details was excellent for approximately 95% of the field of view radius before softening slightly, although the view around the periphery of the image still provided good and usable detail, it just wasn't as sharp as the detail at the center. The design engineers appeared to have used very slight amount of pincushioning distortion to avoid the "rolling ball" or globe distortion effect, as is the case with most modern optics. This Zeiss monocular provides eye relief of 15mm and will accommodate most eyeglass wearers with a rubber eyecup that folds down. You may be wondering if it isn't just a bit "underpowered" at only 6X magnification. 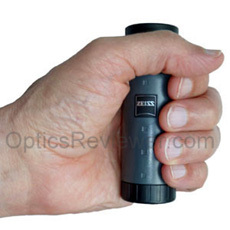 We believe that magnification power in this range is ideal for a pocket monocular. With an 18mm objective lens you have enough power to be able to see clearly, but not so much power that it blurs the image and spoils the excellent resolution of details afforded by the quality of the optics. To say it a little differently, if it were more powerful you wouldn't be likely to see as many details since the greater magnification would also magnify slight body movements and blur the viewed image. By virtue of using an easily adjusted slide focus, sometimes called a push-pull focus, this Zeiss monocular quickly focuses from infinity to as close as a foot/30cm, which qualifies it as a close focus monocular. (The close focus feature will be of particular interest to folks such as museum-goers wishing close-ups of rare art or texts and entomologists wanting excellent close-up views of insects.) This is achieved by using two tubes, with one fitting inside the other one. The objective lens is at the front of the tube which slides inside and has two O-rings to keep dust and moisture out. The O-rings also serve to keep the inner tube from sliding freely and separating from the outer tube. (These are the same O-rings that make the instrument dust and water resistant.) The ocular and roof prism assembly are mounted inside the outer tube. We found fine focusing to be easily achieved by turning the objective lens end of the monocular while pushing in or pulling out gently. Coarse focusing would be a simple push in or pull out on the objective lens end. When first examining the instrument, we pulled with unalloyed enthusiasm and found ourselves holding the two tubes as separate pieces. We were able to carefully, but easily, fit the two pieces back together and they didn't appear to be any worse for the experience. We've no reason to think that the Zeiss monocular designers intended for us to do that, though, so you may want to learn from our mistake and make your focus adjustments more carefully! One member of our team expressed disappointment in the focusing system in that it wasn't as easy to arrive at and maintain a fine focus as those which focus by turning a focus wheel. This seems to be a design trade-off for the ability to arrive at a close focus of a foot/30cm quickly and easily. Where is the Zeiss DS 6X18B T* pocket monocular made? The box ours came in said it was made in Hungary. 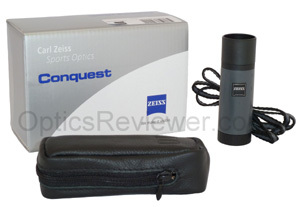 A Zeiss monocular comes with a limited lifetime warranty that's transferrable. While it doesn't (and one wouldn't expect it to) cover misuse, accidents, or instruments that have been modified, cover against defects in materials or workmanship for the life of the instrument. A warranty registration card is provided, but it clearly indicates that registration for Carl Zeiss optics is voluntary and not registering will not diminish your limited lifetime, transferrable warranty rights. It also tells how to transfer your warranty rights to someone else after you've registered your optics in your own name. We appreciate this type of warranty and feel it adds value to the optical instrument. This little Zeiss monocular won our affection pretty quickly and we suspect that we won't be alone. As a close-up monocular, it's excellent. As a monocular for distant views, again it's excellent. For a crisp, clean, clear, well-contrasted view, it's excellent. We highly recommend it. 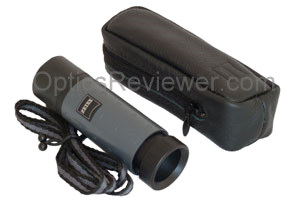 Good pocket monoculars are treasures and shouldn't be lightly regarded! Who will use it? We're betting that it will see a lot of uses we aren't thinking of at the moment. However, we can easily foresee it being used by birders, travelers, backpackers and hikers, fishermen, stadium sports fans, paintball warriors, museum visitors, entomologists, ranchers, and just about anyone who needs an excellent view in an easily-carried optical package. It does command a price premium compared to other monoculars that provide a much duller, less distinct view and we'll leave it to you to decide whether or not its superior optics are of commensurate value for your priorities. We suspect that there will be a number of them given as birthday or special occasion gifts and we'll admit that we would be pretty tickled to receive this sort of gift/award! Where to get it? The customer service is excellent and prices very competitive at Amazon.com and Amazon.co.uk .